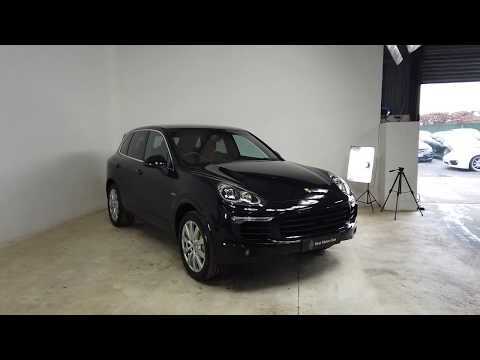 Kent Motor Cars are delighted to offer this stunning Porsche Cayenne Hybrid for sale. The car has been exceptionally maintained and remains in a fantastic order throughout. The car benefits from a full Porsche service history as well as many features and options such as 20" alloy wheels, climate control, leather trim, navigation system, panoramic roof, parking sensor(s), privacy glass, heated front seats, reversing camera, lane change assist, bi-xenon headlights, adaptive cruise control, BOSE sound system, rear entertainment, 20 inch Cayenne sport design wheels, 14 way comfort memory seats as well as many more features. **VIEWINGS BY APPOINTMENT ONLY** Please visit www.kentmotorcars.co.uk for more information. Kent Motor Cars are FCA regulated and subsequently offer a range of financing options. Receive a part exchange value for your vehicle & get pre-approved for the finance before even leaving home. Test-drives can be arranged with vehicles being able to be driven away on the same day. Please don’t hesitate to call us on 01732 240107 to discuss in more detail. Please contact us on 01732 240107 to discuss the Warranty options available for this vehicle. Welcome to Kent Motor Cars. To optimise your experience, cookie settings on the website are set to allow all cookies. By continuing your journey throughout the website, you consent to this. You can change these settings here.